Describes how long-term frequency data can be collected using a computer in place of (or in addition to) a stepper motor. This is the second article of a series. The circuit in the previous article (Figs 1-2) uses a stepper motor as its 'slip memory', or 'phase accumulator'. Each step represents one cycle of phase slippage. The aggregate slippage is represented by the number of steps noted by a pointer connected to a stepper motor shaft, pointing to a scale, after some time has elapsed. The only other input needed to calculate the stability of the oscillator under test is the elapsed time in seconds - the test's stop time minus its start time. The computer offers a way to automate the process for long-term testing. Since I have a computer here that runs 24/7 (the computer that hosts this website), I decided to build an interface and write some software to do the number crunching. The two figures below show the comparator schematic with the computer interface added (Figure 4), along with a slightly modified quadrature mixer circuit (Figure 3). The interface (Fig 4) consists of two cascaded CD4516 4-bit binary up/down counters, together comprising an 8-bit binary up/down counter, and a 74HC244 line-driver. The 8 output lines from the line driver connect, through a parallel printer cable, to the computer's parallel I/O port. (The parallel port was used to connect a printer in computing's olden days.) The OE (output enable) line delivers a signal from the computer telling the comparator when it's ready to accept data. When the OE line goes low, the line driver outputs are enabled. The counter is the 'first-order' counter of the system. It keeps track of the pulses from the quadrature mixer. 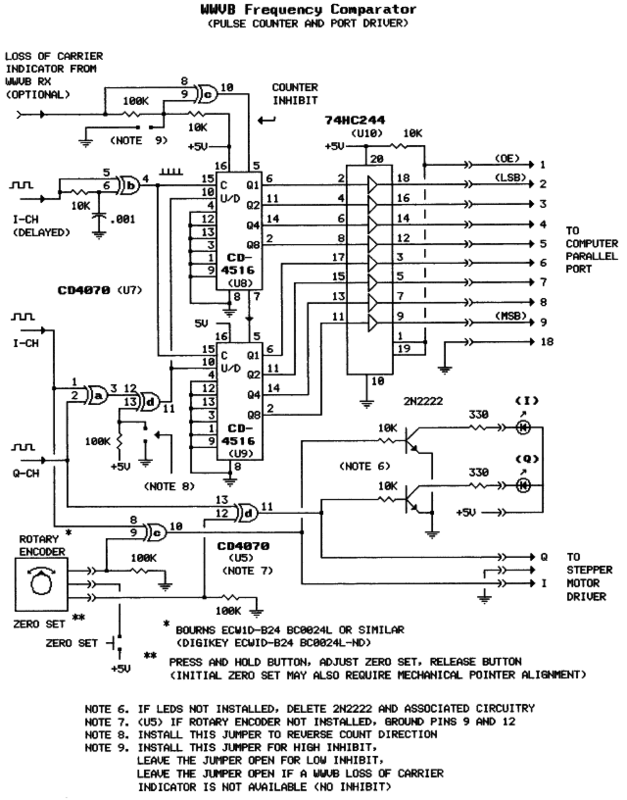 Note that there are two inputs to the counter, analogous to the two inputs to the stepper motor. One input is called 'clock' (C). The counter registers a count each time the clock signal goes from low to high. The other is "up/down" (U/D). It tells the counter what direction to count, high up, low down. The clock signal is derived from a separate filter/Schmitt trigger gate, shown in Figure 3, called the "delayed" I-channel. (See: LP Filter/Schmitt Trigger*) The delayed I-channel gate is designed with a wider hysteresis band than the I-channel gate below it (note the 22k resistor in leau of 100k across the feedback capacitor). The phase information is conveyed in the duty cycle of the comparator output pulses, as shown in the figure below. The first line shows the pulses as they come from the comparator. The second line shows the pulses after integration by the LP filter (comprised of the 10k series resistor and .1 uF feedback capacitor). The third line shows the logical output from the Schmitt trigger (the two series inverter gates and feedback resistor). The fourth line shows the "delayed" logical output (the delayed output is used for the computer-interfaced version only). The delayed LP filter/Schmitt trigger circuit is identical in all respects, except for substitution of a lower-value feedback resistor (22k) in the feedback loop. 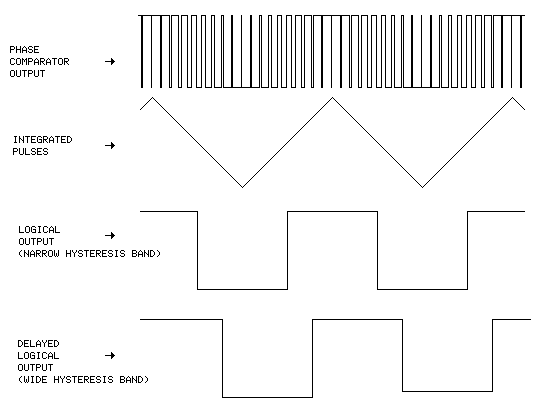 The lower value resistor results in a wider hysteresis band, which generates a delay of about 45 degrees. The delayed I-channel signal is further processed by U7b which generates a clock pulse on both the rising and falling edges. The counter is clocked on every other step of the stepper motor, thus the effective sample rate is 500 kHz. The result of these two processing steps is to assure that the clock signal cannot change state before the U/D signal changes state, thus assuring that one and only one count will be registered for each cycle slip. 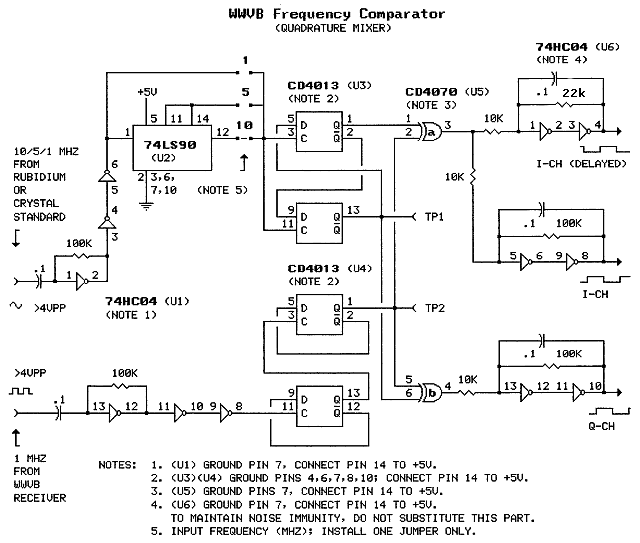 The U/D signal is generated by combining the I-channel and Q-channel signals in U7a. The signal is inverted (or not inverted) by U7d so as to generate counts in the positive direction for positive phase slips (or negative direction if selected by a jumper to ground on pin 13). Note that there is some ambiguity built into the counter. After it reaches full count, binary 11111111 (dec 255), on the next (up) clock pulse the counter reverts back to 00000000, registering a huge step backward. Likewise, when the counter reaches 00000000, on the next (down) clock pulse it jumps to 11111111, registering a huge step forward. To keep the hardware simple, the ambiguity is dealt with in the software. The WWVB receiver provides a "loss of carrier" indicator output line. A low on this line indicates when the carrier from WWVB is not present or is of low quality (low S/N). This signal is used to inhibit the counter during loss of carrier intervals, preventing it from accumulating spurious counts. I discovered that the CD4516 counters can hold the slip count through a power outage of at least an hour or two (I never tested the limits). There may be enough residual charge in the energy storage capacitors in the comparator's power supply and elsewhere to enable this "feature", or it may be something inherent in the CD4516 chip. When power returns, the count accumulation resumes, starting at its pre-power-failure value with nary a blip. It's pure serendipity. This capability was not designed into the circuit. The section below presents the real-time data now being collected by the computer connected to the WWVB Frequency Comparator, along with their evaluation. At scheduled intervals the web server calls up a program which reads the output from the WWVB frequency comparator via the computer's parallal port and appends the current data byte to an accumulator file. The oldest entry in the accumulator file is thrown out. The accumulator collects 25 successive data and time readings. For the current test, the slippage data are being read automatically once every hour (3600 seconds) and may also be read manually more often. and dt is elapsed time in seconds. *More commonly called Offset from Nominal, or just Offset. Frequency Error = dN x 1/500000 x 1/dt. The table below shows the last 25 raw data outputs from the frequency comparator (in decimal format) along with the times the data were recorded. The latest entry, recorded/calculated within the last hour, is at the bottom. The hourly phase slip data for the last 24 hours are displayed on the graph below. This is an expanded graphical representation of the information shown in the left column of the table above - phase slip count (N). Vertical Scale: The center number, on the red graticule line, shows the 24-hour average phase slip count. The numbers above and below the red line show deviation from average. The latest point (#24) was recorded/calculated within the last hour. Violent excursions are usually caused by your experimenter manually adjusting the device under test or otherwise fooling with the test setup. Twice-daily average phase slip and correction voltage (if applicable) data are shown on the graph below. The plot shows the trend over 31 days. Its flatness (or lack of) is an indication of the intrinsic stablility of the oscillator. This is another representation of the step information shown in the left column above. Phase slip count is averaged [(N1 + N2 + ... + N12)/12] and plotted at 12 hour intervals. Left Vertical Scale: Average absolute phase slip count. The latest point (#31) was recorded/calculated within the last 12 hours. Twice a day, frequency error is calculated and plotted on the graph below. 31 days worth of error data are shown. The latest point (day #31) was calculated within the last 12 hours. When the oscillator under test is being disciplined by the controller, the frequency offset averaged over a long period of time will approach zero. instead of a computer to accumulate phase-slip data. The first article in this series. to an analog voltage and presented back to the ovenized oscillator to "discipline" its frequency. The third and concluding article in the series. 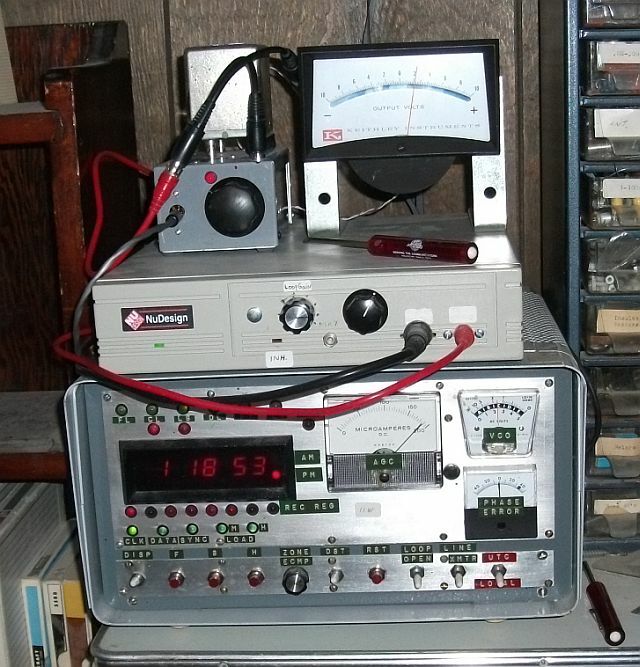 In 2012 the receiver had to be modified to accommodate a change in WWVB's transmitted signal. Type your comment/question below and click SEND. No information about yourself is required. This box posts to an open forum.